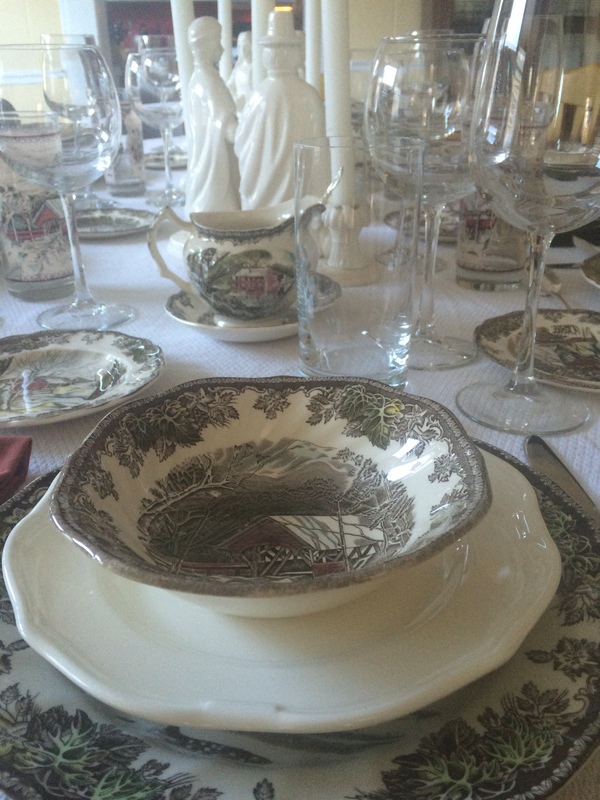 This was a part of my personality that didn’t come out till I left home and established my own nest, but it seems I inherited more than my mother’s penchant for period literature–I’m obsessed with dishware and love to throw a really good party, just like my mom does. Above is a snapshot of the setting which greeted me and fellow Thanksgiving-attendees this November at our friend’s home. When I posted the photo to instagram, more than one person chimed in with some variation of: “This was my grandmother’s china! What a wonderful memory!” I offer my own hearty Amen!–since I was small, the Johnson Brothers’ Friendly Village pattern meant Christmas Dinner. More, really, than Christmas Dinner (though, I think, it was the only time we used this pattern, having an antique turkey pattern for Thanksgiving), Friendly Village was harbinger of celebration, marker of significance, backdrop for not only delicious food but also for family camaraderie. So, for those of us who are separated from our loved ones and families during holidays, using familiar china is sort of like still being at the family table, remembering holidays past and enjoying a real link to those celebrating the same occasion miles away, because really, there’s only one set of any pattern, isn’t there? It’s as if we are eating together, though we’re separated by space and perhaps even time, because we’re sharing important elements of the meal–in this case, the china pattern, though the ideas extends to the food itself, too, the turkey, or favorite family-classic dishes. One might even say that bread and wine are the elemental foundations of a meal, shared in many churches every single Sunday for that exact reason. This entry was posted in community, Eucharist, family, food, liturgy, relationships, worship and tagged Christmas dinner, community, entertaining, Eucharist, food, Friendly Village, party, Thanksgiving by Emily. Bookmark the permalink.